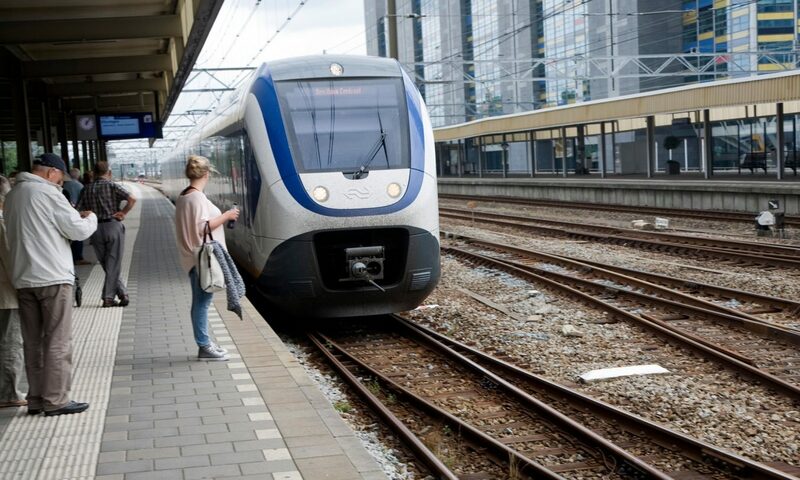 ll Dutch trains have become 100% powered by electricity generated by wind energy, the national railway company NS said yesterday. “Since the first of January, 100% of our trains are running on wind energy,” said an NS spokesman, Ton Boon. Dutch electricity company Eneco won a tender offered by NS two years ago and the two companies signed a 10-year deal setting January 2018 as the date by which all NS trains should run on wind energy. “So we in fact reached our goal a year earlier than planned,” said Boon, adding that an increase in the number of wind farms across the country and off the coast of The Netherlands had helped NS achieve its aim. Eneco and NS said on a joint website that around 600,000 passengers daily are “the first in the world” to travel thanks to wind energy. NS operates about 5,500 train trips a day. One windmill running for an hour can power one train across about 200km (120 miles), the companies said. They hope to reduce the energy used per passenger by a further 35% by 2020 compared with 2005.